CUSTOM DRUMSTICKS - Custom Drum Sticks with Your Name. Now you can have custom imprinted drumsticks - personalized drumsticks just like the pros. Get your custom signature engraved name on high-quality professional drum sticks today! Buy just one laser-engraved pair of sticks or large quantities of custom drumsticks. Promotional Drumsticks or Promo Drumsticks with logo also available. Custom Drumsticks - Have special-size drumsticks custom made for your specific application with your name or for promo events. Colored Drumsticks - We can now imprint colored drumsticks. Miniature Drumsticks - A wonderful promotional item. 8" long. Full Color Drumsticks - They're new! They're brilliant! They're imprintable. Engraved Drumsticks - Give as a gift for your drummer. Engraved. Personalized Custom Drumsticks are available in different wood types, sizes, tips, and custom finishes. The leader in Cool Drum Gifts and Accessories. We now offer full color custom drumsticks! 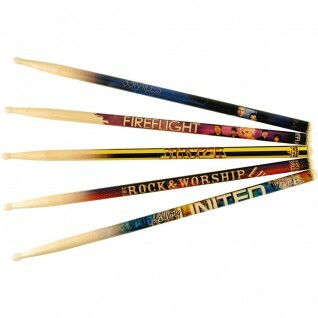 Newer on the market are full color customized drumsticks featuring the artwork of your choice. Sometimes clients want custom sticks with more of a punch and color will always do the trick! These are not wraps folks. The band or promotional drumstick design is adhered to the stick with a special process to ensure quality and longevity. Your custom artwork comes to life in a fresh new pair of sticks that are ready to impress! We just finished an order with a law company that used them at a conference in New York and they came out stunning! - Call 1-800-378-6286 for more information about these colorful, full-color printed sticks. Custom made Drumsticks with Your Name or Band Name! Put your name or logo on your drumsticks. Drum Bum, Inc. features professionally made drumsticks with your name laser-engraved on them. Or, we can offer cheap pad printing. Custom engraved drumsticks are the way to go if you want to spend a little more money. They have a nice, finished look to them. You can put them on a display shelf or toss them out into the crowd. Shop Drum Bum for your very own custom, personalized drum sticks. We've got blank drumsticks too if you have the need. Buy in quantity and save. Drumming Up Business! - Looking for places to advertise drums or your drum company or drumming event? We'll get you on our network where you can be seen by thousands of drummers and musicians of all types. Call 1-800-DRUM BUM (378-6286) for more information. We have had the pleasure of serving many brands through the years including Allstate Insurance, Live Nation, Hard Rock Cafe and numerous others. Our light up sticks made their debut on 'The Voice' in 2015. We can customize our light up sticks as well with a marketing message or company brand. Whether it be plain, wood sticks or fancy, colorful sticks, we can provide the perfect custom choice for you and your company or brand's next event. Call us at 1-800-DRUM BUM to get a quote for your drumstick idea. Our hours of operation are Monday through Friday, 10-5 EST. Give us a call and let us know how we can help you drum up some business with your own specially made drumming sticks. Custom Drumsticks, Personalized Drum Sticks with your name! Use "Drumming Up ________" as your slogan for a motivational event. We have your custom drumsticks. Participants love the idea and get excited to get something free at the event. For promotional ideas, this one's a sure fire winner. We have worked with dozens of companies through the years and produced tens of thousands of drumsticks for name brand companies worldwide. Call us at 1-800 DRUM BUM. We now carry exercise drumsticks for aerobic fitness classes. Add some spice to your workout! or aerobics class that incorporates cardio drumsticks, we can fix you up with weighted sticks.